Each layer has a series of parameters that you can modify to adjust an element's position. 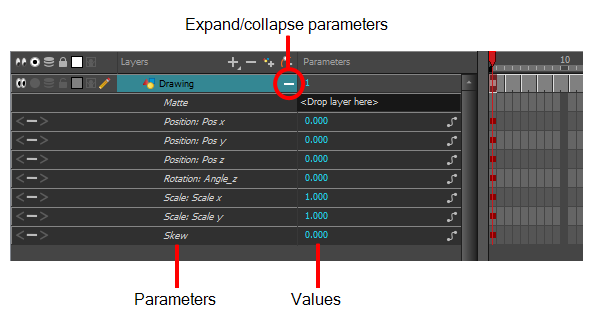 You can access these parameters in the Layer Properties view. In this view, you can type in a value instead of moving the object in the Camera view. These values can also be animated over time. NOTETo learn more about the layer parameters, see Drawing Layer. You can also access a layer's parameters in the Timeline view. Click on the Expand Parameters button. 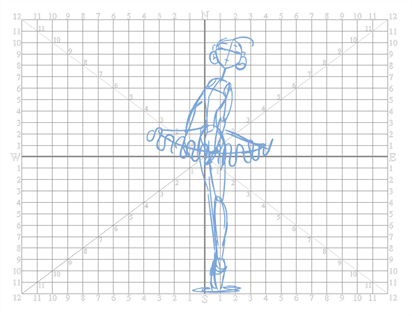 In Harmony, a drawing's pivot is located at the centre of the field chart, regardless where your drawing has been drawn on the page. Your drawing is the entire sheet of paper, not only the drawing strokes you have drawn on the page. This allows scanned drawings, imported images and paperless drawings to be properly registered together.